I love corn, the most proletariat of vegetables. It is the favorite vegetable of most Americans; indeed, it is the one vegetable that has been eaten by most Americans, even the broccoli averse. I love corn because it is the most natural accompaniment to a burger, a boiled lobster, a rack of barbecued ribs. I love corn not because it shows up in all sorts of nightmarish, chemical-laden artificial concoctions dreamed up by food scientists but because it is delicious on its own, almost untouched even by the loving hands of the cook. I love corn because it is one vegetable that has pretty much escaped the global supermarket. It has its season, and its season is summer. I love corn because it reminds me of my father, who detoured on his way home every summer night to buy corn at a local farmstand. I love corn because it demands nothing of me — neither skill nor attention nor embellishment. Sure, you can fold it into a creamy chowder or combine it with eggs in a fritter or pudding, but why bother? A quick steaming brings out the corny flavor. Some people rub butter on the hot ears and sprinkle with salt, but I prefer mine unadorned. It has been a rainy, rainy summer. 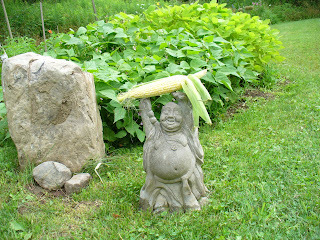 So the appearance of local sweet corn in Middlebury markets came as something of a surprise last week. The corn was delicious. More than that, it signaled the arrival of high summer, despite all the sodden fields, the cool temperatures, and my own inert garden. Some growers have prevailed over very challenging conditions, and I am grateful to them. If you shop at a farmer’s market or a local farmstand, chances are you’ll get corn that was harvested just that morning. Get it home and refrigerated quickly to preserve that farm-fresh flavor. Buying corn at a grocery store can be a tricky business. Old-school cookbooks will tell you that you must buy fresh. Fresh! And there are all sorts of ways to determine freshness: the stem end should be damp and pale green in color, the silks a sticky yellowish brown. But the truth is that with the new “sugar-enhanced” hybrids, an ear of corn can hold its flavor and sweetness much longer than previously. So, depending on the variety, an ear that is a few days divorced from the field in which it grew may be tastier than one freshly picked. Do choose plump ears. Peek inside the husk to check for worms or brown spots. Kernels should be close together and shiny. Shiny is important. Decide to pay for that ear of corn whether or not you will buy more, and take a bite. Spend the $.75 to determine if the corn meets your taste standards. If it is delicious raw, it will be perfect steamed and served plain. If it tastes old and starchy, plan to cut the kernels off that lone ear and throw them into a chowder, a stew, even a stir-fry. Refrigerate fresh corn, and shuck the ears at the last minute. And as you peel away the green husks and remove the pesky silks, take a moment to marvel at the construction of the ear of corn. As it grows, a well-developed ear emerging from a cornstalk will have 750 to 1,000 ovules (potential kernels), each producing a silk. At the tip of the corn plant, which looks like a little antenna, is a tassel that produces pollen. Each tassel contains 2 to 5 million grains of pollen, which equals 2,000 to 5,000 pollen grains for each silk of the ear shoot. Wind carries the pollen to the sticky silks, and the pollen migrates down the silk, fertilizes the ovules, and creates the tasty kernels. To get this ear of corn, you needed the labor of the farmer, the rain, the wind, the sun. It’s a pretty marvelous system when you think about it. Andrea Chesman is a food writer and author of many cookbooks, including Serving Up The Harvest, Mom’s Best One-Dish Suppers, and Pickles and Relishes and is coauthor of Mom’s Best Desserts and The Classic Zucchini Cookbook from Storey Publishing. She has also written and edited numerous additional cooking, food, and garden publications. Andrea, I like the idea of buying just one ear to sample raw. I can't tell you how many times I've bought a dozen this summer only to be disappointed.